This is my teaser image for the beads I am sending to my swap partner Skylar. Skylar is a bead embroider and you can see her work on her blog or in her Etsy shop. This is going to be so much fun! I cannot wait to see what she sends me but, more than that, I cannot wait to see what she creates with what I am sending her. I had a lovely focal sitting in a box and knew it would be AGES before I got to it, so I am sending it to a new, loving owner. It's a form of "re-homing", you see. And in other news, I am working on new tutorials, revamped tutorials, and new patterns. I've also got lots of finished pieces to start adding to the shop, and I am very excited about all of this. As some of you may know, we like to fish. This photo was taken in a little bend of the Blanco River. This spot is usually no more than eight feet deep and is full of feisty fish. If you look at the right hand side of the photo you can see the branches of some saplings. This is where I usually stand to cast my lures. This was after over six inches of rain early Wednesday morning and, since the photo was taken around 5:00 p.m., the water had actually receded quite a bit. The spot I usually stand in is just to the left of those saplings. The water was flowing pretty darned fast and we watched an ARMCHAIR float down the river. By tomorrow morning, the flow will be slower and water will be lower, so we will go wet some line and hope the fish are biting. Whatever you do this weekend, I hope it brings you joy! Bead on, beadlings! 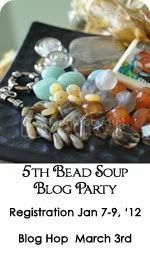 My name was one of those chosen for the 5th Bead Soup Blog Party. I'm very excited. I got to meet my swap partner the other day and I want you to meet her. Her name is Skylar Bre'z. She is member of both the Etsy BeadWeavers Team and the Etsy Bead Embroidery Guild. Check out her shop and see just what she creates. My fingers are crossed and all I can think is "oh boy, oh boy, oh boy!"